Religious scriptures of every religion offer an extraordinarily beautiful place of supreme bliss, devoid of sorrow, with everlasting happiness and enjoyment. Such places are known as "Svarga" to some group of people, "Paradise" to some other and "Jannat" to another group. We, Mountain lovers by religion, call it 'Devatātmā Himālaya' (Himalaya - the Divine Soul). Himālaya - The King of Mountains (Nagādhirājaḥ) is situated along the northern border (Uttarasyāṁ diśi) of India, covering approximately 2400km. from west to east and enamouring aesthetes since time immemorial. A sheep of the same flock understands for sure, when Himalaya beckons, it is nothing but impossible to ignore. So when we got the divine invitation we just turned the chance to a good amount despite a mild frictional force imposed by our families. After successful completion of Sandakphu (West Bengal), Annapurna Base Camp (Nepal) and Maenam La (Sikkim), Abhisek, Niladri and me, three musketeers of Padatik (We missed our convenor Sudip due to some inevitable circumstances), decided to explore Garhwal region in Uttarakhand. After a long research work and feasibility analysis, the cold war between Har-ki-Doon and Satopanth Taal came to an end when the second one was stricken out on the ground of availablity of time interval. Trek to Satopanth Taal usually begins in June, but we could manage last week of April. Har-ki-Doon (literary, The Valley of God), a valley surrounded by snow capped himalayan peaks, is situated in western Garhwal region of Uttarakhand. Nearest railhead to Har-ki-Doon is the state capital Dehradoon which can be accessed from Kolkata by 13009UP Doon Express and 12327UP Upasana Express**. On April 24th 2015, we boarded Doon Express, our mobile home for next 34hours (according to time-table) at 8:30pm. It is the better option for us as it is scheduled to reach Dehradoon early in the morning and as for me, the best option as it touches at Serampore, my hometown. Next morning with a cup of tea, we were planning to take some photographs of ghats of Varanasi form the running train. The train was about one and half hour late. All at once Abhisek quoted a status from facebook about major tremor felt in West Bengal, Bihar, Uttar Pradesh and Nepal. Reaching Mughalsarai, we came to know about a devastating earthquake, having epicenter near Kathmandu. Naturally the spotlight shifted from Varanasi's ghat to Varanasi station. Should we flinch from our programme and catch a train to Kolkata or take heart and proceed? Mixed negative, semi-positive, positive counsels like "Cancel your trip and come back home", "Contact police/army at Dehradoon, if they permit then proceed", "Keep a sharp lookout before every step" etc. from relatives and friends was coming continuously via phone calls, Whatsapp and Facebook. The situation got harder when some heavy aftershocks were felt. Standing steadfast to fulfill a dream and returning back to home safely were playing tag-of-war with us. At last, gathering important information from GMVN, Uttarakhand Tourism and other sources, conferring with our own mind, we took a decision with one accord, "When our destination is God's own valley, let him indite our destiny." It was then 10pm and the train was leaving Lucknow. yesterday's earthquake we could trace in the busy city, to be sanguine, we contacted our guide Mr. Balbahadur and he assured that everything is alright throughout the route and he with his full team was on the way to Purola, our meeting point. We hired a prepaid cab to Purola, from Dehradoon taxi stand, just outside the Railway station. It was a journey of 5-6hours via Mussoorie**. Purola was a small but busy town in a vast valley. Actually we had to halt there mainly for acclimatisation and to avoid the exhaustive journey of more than 200km in a single day to Taluka from Dehradoon. We received a warm welcome from Mr. Balbahadur, a 62 year old young sherpa and his team members, Tejbahadur, Maansingh, Gangaram and the youngest one, Rony. Our team of eight spent that evning in the small market of Purola, buying our next few day's provisions. Bahadurji arranged tents, sleeping bags and others necessary trekking gears from Nehru Institute of Mountaineering, Uttarkashi. (Govind Wildlife Sanctuary), near Netwar we had to register our name and take an entry pass for next few days. Everywhere on the both sides of the road there was signs, reminding about the disastrous flood of 2013. Specially the condition of the single way from Sankri to Taluka was just horrible. It requires high efficiency and concentration to cross some waterfalls flowing over the roads with heavy current. Taluka, a peaceful hamlet with 20-30 cottages of locals and a few lodges for trekkers including a Forest Dept. 's bungalow and a GMVN guest house, surrounding a tālāo (pond), was the last point en route having jeep and BSNL (only available network at and after Sankri) connectivity. The trekking trail begins from here and stretched upto Chhitkul in Himachal Pradesh via Osla, Har-ki-Doon Morindataal and Borasu Pass. Another trail, bifurcated at Osla, leads to Yamunotri via Ruinsara taal and Balipass. At first we made a plan through the second route, but when we discussed it with Bahadurji, he advised us not to take the risk of balipass at April's end, due to high possibility of heavy snow at an altitude 4,940mt. (17,00ft.). The total distance from Taluka to Har-ki-Doon is around 25km. having three beautiful Garhwali villages Ghangaad, Osla and Seema in between. Mythology says, at that age of Mahabharata, this region was ruled by King Duryodhana, the antagonist of Mahabharata. Locals still believe themselves as ancestors of Kauravas. There is also a temple dedicated to Duryodhana at Osla (another one is in Kerala). 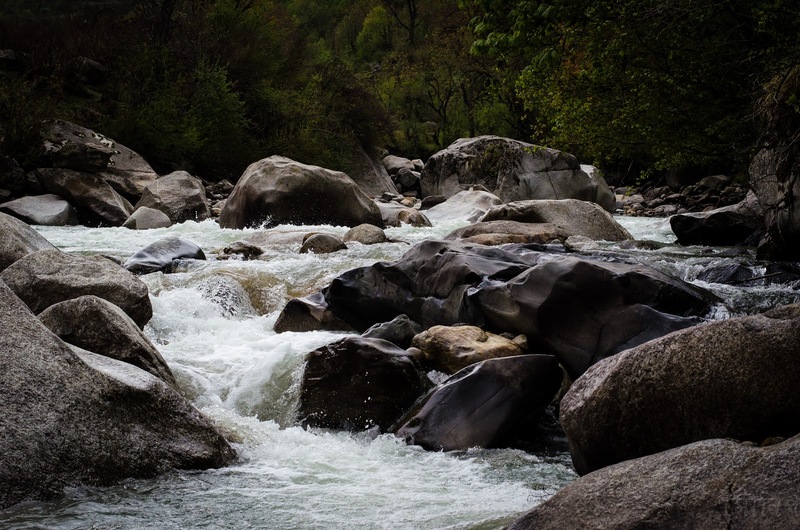 Tamasā, commonly known as Tons, a major tributary of Yamunā accompanied us from Mori to Sankri and then Supin, a tributary to Tons, took the charge upto Har-ki-Doon. Some legends refer this Supin as Sarasvati, the lost one among the famous river trio, beside which Vedic civilisation flourished. On the sunny morning of 27th, around 7:30am, we began. After seeking blessings from the almighty, Niladri shouted, 'śubha yātrā bandhugaṇ' (Happy Journey folks) to energise the begining. That day we were the only team left Taluka. Thanks to Maansingh that this time we didn't have to carry our rucksack. Niladri and Abhisek also deserve a huge thanks as they shared necessary provisions like medicines, chocolates, toffees, some dry foods, raincoats etc. and allowed me to carry my camera to frame every memorable moment. Bahadurji scheduled our first night stay at the village Osla, 12 km. from Taluka. First few kms of the distance ran through the bed of Supin, and the rest gained altitude gradually. From the beginning we walked slowly through the woods, smelt the fresh smell of the greeneries, framed Supin dancing in the middle of the green valley with a snow capped anonymous peak as background, posed for DPs and GrouPs, watched Himalayan birds, enjoyed every second with nature and silence. In a nutshell, we did what we planned to do, but then we didn't know, something was waiting to surprise us, totally unplanned. At a nice campsite beside Supin, we put down our bags for resting and having some chocolates. A bevy of 3/4 foreigners returning from Har-ki-Doon were already resting there. In course of conversation, they advised us to start the early in the morning and finish around 2pm, as after that, weather turns extremely bad and it could be very tough to walk under heavy rain. Our enthusiastic blood then cared a hang. Having a long DP session, when we started, Niladri pointed a portion of the snowy mountain, where clouds accumulated. Bahadurji and others were waiting for us in a tea stall. For fear of rain, he told us to keep our raincoat with us and walk faster, it would downpour. How perfect was his prophecy, we realised within next 30minutes. We had to put our rain coats on and wearing mine, bought from Gaurikund - on the way to Kedarnath, I resembled an alien, according to Niladri. of the overflowed falls coming down with full force, above all the dreadful Himalayan shower, storm, lightening and no provision for shelter - the overall ambiance was exceptionally thrilling. 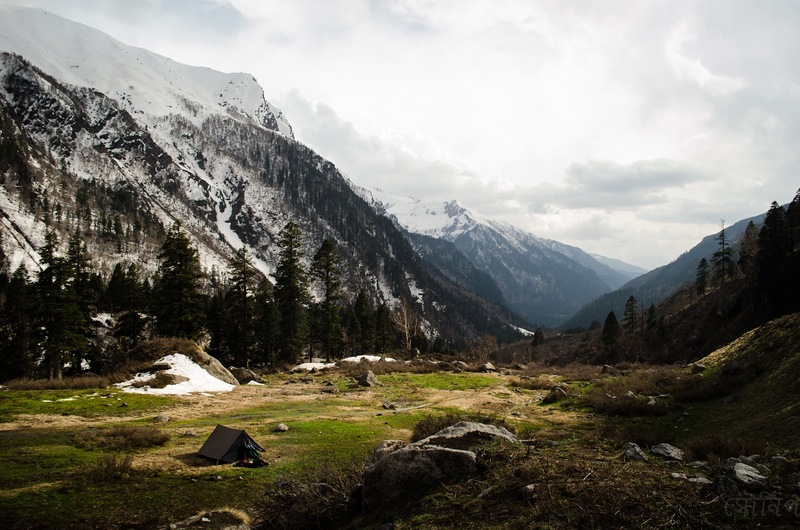 For night stay Bahadurji settled upon a very small field on Supin, a few kilometres before Osla, to avoid the cumbersome uphill trek through the muddy trail. It was still raining and we took shelter inside the tent. We were thinking to ask Rony for a cup of tea, when he entered with 3 plates of smoky khichri to relief us from this moist chilling weather. After an hourlong shower, the Sun revealed his face tearing the thick layer of cloud. We spent that lazy afternoon lying on a stone in the middle of Supin and watching sunset on that anonymous peak, which we later recognised as Har peak. Osla, the house of Duryodhana temple, was the last village having the only STD booth. Hiking about 45mins from our campsite, we halted there for contacting our families and to assure them that we were safe in the land of Duryodhana, Garhwal was unaffected in the earthquake. followed him but we could not throw our packs as mine contained the camera and Abhisek's contained important medicine. This meadow is known as Kalkatiya Dhaar. 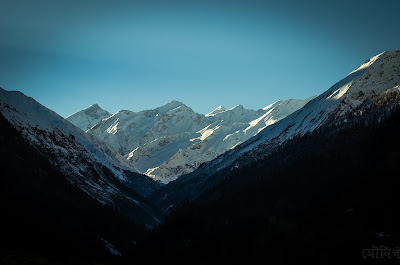 Bandarpuchha massif is a cluster of some snow covered six-thousanders, Kālnāg (Black peak), Bandarpuchha I, II and III (White peak) and some other anonymous peaks. 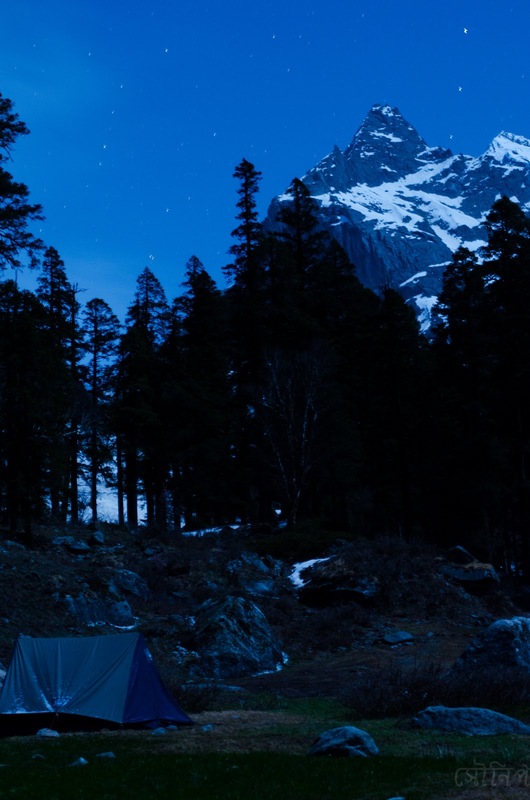 We asked Bahadurji, if we could settle there for that night, but he disagreed as it would be too far from Har-ki-Doon. We rested at Kakatiya Dhaar for an hour, bathed in sunshine, lied on grass, watched the nature at its best and finally , before leaving, had Roti with boiled potato in our lunch. Just after the meadow, the trail entered a forest, teemed with bear according to Maansingh, where we met another team coming down from Har-ki-Doon They shared their experience of snow covered Har-ki-Doon and wished us best of luck. The second steep ascent was inside this forest and we experienced our first snow trek there, though the snow-covered length was very small. On the other side of the forest, Bandarpuchha massif was not visible and Har peak was dominating the horizon again. falling rapidly with daylight. Bahadurji was sharing his 50 years' action-packed experience of trekking. These old fellow left no stones of Uttarakhand, Himachal and Nepal unturned, moreover some treks he had done more than 5 times. Maansingh shared his horrible experience of living 7 days in heavy snow only depending on water at Rupin Pass, during the devastating flood of Uttarakhand in 2013.
smiling in the middle of the sky visible to us, flooding the valley with her silvery glaze. Temperature was then 1 or 2 degree centigrade when I fetched my camera from the tent and set it up on the tripod with help of Abhisek and Niladri to shoot the pristine moonlit beauty of this serene Himalayan Vale. After dinner with Rony's delicious Dāl-bhāt and curry, we sat spellbound outside until temperature compelled us to go inside the tent. We forgot to keep the track of time, once again. Har-ki-Doon, is so called because this pristine valley was believed to be the place for pleasure-trip of Hindu deities. At an altitude 3556mt. this green valley is surrounded by sky embracing peaks like Svargārohiṇī, Har peak, Ruinsara peak and some others. According to Hindu mythology, Yudhisthira, the eldest Pandava who alone could reach Svarga alive, left for Svarga from Svargārohiṇī*** - Steps to Heaven (In Sanskrit Svarga means Heaven and Ārohiṇī means steps). Our final ascent to this valley began early in the morning of 29th April. From our last night stay the valley was about 1.5-2km. Just after our tent there was a small forest, on the other side of which was the Valley of God. The trail, in toto, was covered with thick snow due to yesternight's snowfall. 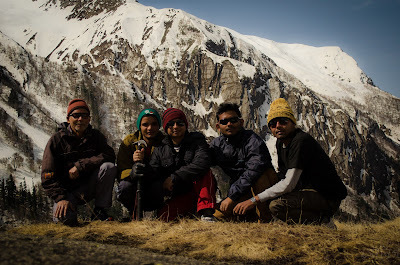 We three with Bahadurji and Rony were approaching slowly and carefully through the slippery trail to reach our dream. It was Bahadurji's 6/7th time and Rony's 2nd time to Har-ki-Doon but we couldn't find them a bit less excited than us. Crossing the forest, we reached the entrance of Har-ki-Doon, from where we caught the first glimpse of the pyramid shaped Svargārohiṇī above the trekkers' hut of Har-ki-Doon. Above our head the sun was shining brightly in the blue sky, in front of us was gigantic Svargārohiṇī - the prima donna in the north, Har peak in the east, Ruinsara range in the north-west and Moninda peak in the south and we stood completely baffled surrounded by them. Har-ki-Doon is the base of all these peaks. At the base of Svargārohiṇī, Yamadvar (also known as Jamdhar/Jaundhar) glacier was glittering like a silver sheet. Supin emanating from this glacier was flowing through the valley and divided it into two nearly equal portions. It took a considerable amount of time to realise that, what was in our vision was not a reverie, it did exist in reality. This 'Elysian Vale' is rightly awarded the epithet - 'The Valley of God'. Could the Steps to Heaven offer a better place? A better Svarga? Now we have enough reason to doubt the existence of such Paradise. ".... Viṣṇupatnīṃ namastubhyam padasparśam kṣamasva me." The climax was over. We then knew, God had furnished our destiny with a grand success. Rony with Bahadurji was leading us and my two fellows followed them, but I couldn't walk faster as something was pulling me from behind. Though the battery strength was notifying red, I couldn't help framing what was in my vision. I was alone, yes, in the valley of God, I was with myself only. I was approaching towards our tent, but looking back at the Valley, Svargārohiṇī, Har peak once in every second. It seemed that all of them were waiving their hand to bid me goodbye. I entered the forest, where Abhisek and Niladri was waiting for me. I was scared, that they would blame me for being late, but they didn't. When I asked for pardon, they smiled and assured, that they couldn't even thought of to blame me. Due to the sublimity of the space and time, their grievance might have disappeared. We set out for our next undecided destination, after having parānthā with bhāji. The guy, Rony, owe lots of thanks for filling up our appetite with varieties of palatable Garhwali items whenever we needed. Bahadurji's plan was to descend as far as possible. But we kept Kalkatiya Dhaar selected for that night's shelter with an eye to watch majestic sunrise on Bandarpuchha massif. As Bahadurji prophesied, after 12o' clock, the sky started changing. Bahadurji with his team was far ahead of us, so we had to accelerate. When we reached Kalkatiya Dhaar, we found our teammates already lying on the grass outside tents. May be, this venerable sherpa had some extraordinary power, to read our mind and set the tent in that heavenly meadow. When we reached, the sky was overcast and a heavy wind was flowing, but the rain was waiting for us as we were having our meal together under the open sky. 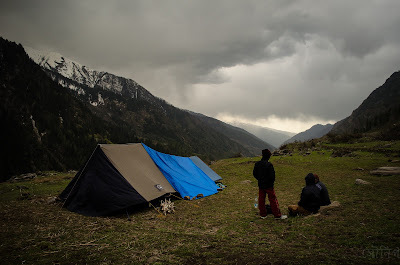 We stood outside the tent and watched the rain rushing towards us from the east, until it started downpouring on us. A sleepless stormy night that was. The storm lasted till next morning and many times in between it tried to uproot our tent. over the meadow, Bandarpuchh massif was waiting under clear blue sky for the sun to shower gold on them. We all came out of the tent to frame the golden moment. For the first time in this trip we got the clear-most view the massif. Gradually, all the peaks, including Kedarkantha in far east, were kissed by the golden ray of the Sun. At that moment, to give us relief from cold bite, first ray fell on the meadow also. Having our breakfast in clear sunshine, sitting on the meadow, we set out for our final descend to Taluka via Seema. Upto a few kms after Seema whenever we looked back we saw Har peak looking at ourselves with an expression, which we read, "Punarāgamanāya ca" (Visit again). At last we had to bid the final adieu. Having lunch at Taluka we departed for Haridwar, via Sankri, Purola and Dehradoon around 3o'clock. In a few minutes the jeep took a sharp left turn and Taluka disappeared from our vision. "Thy genuine image, Yarrow! ", excerpted Abhisek the mots justes, "Will dwell with me - to heighten my joy, And cheer my mind in sorrow". Svargārohiṇī, Har peak, Ruinsara peak, Moninda peak, Yamadvar glacier, Supin, Osla, Seema, Taluka and every moment of the trip will dwell with us as a sweet memory to cherish forever. ==> Here is our photologue. ** For details, click HERE. ***There is another Svargārohiṇī, near Satopanth taal in Garhwal Himalaya, which is also referred to as Yudhisthira's steps to heaven. **** IAST scheme is followed throughout to transliterate Sanskrit verses and names, Hindi and Bengali quotes. Please go through our Annapurna Basecamp, Maenam La travelogue. COME BACK WITH MEMORIES TO CHERISH FOREVER ALONG WITH PLASTICS, BOTTLES, WRAPPERS etc. LOVE HIMĀLAYA - THE ABODE OF GOD. KEEP HIMĀLAYA CLEAN, GREEN AND SAFE. Max. Altitude: 3556 mt./ 11667 ft.
Best Time: April to June and September to November. To reach Dehradoon from your hometown, you have to avail train or flight. If direct train or flight is not available, Dehradoon can be accessed via Delhi from every corner of the country and abroad. Delhi to Dehradoon takes, in an average 7-8 hours by train. Buses are also available. Acclimatisation day in Purola. It is nearly 5 hour's journey from Dehradoon to Purola (140km). Purola is a small town having nothing special to do and see. This evening can be utilised for buying next few day's food and other provisions from Purola market. Taxi fare Rs. 3300/-. Destination of this day is the base camp of the trek - Taluka via Mori, Netwar and the nearest bus head, Sankri. Sankri is 61kms from Purola and Taluka is 12kms from Sankri. The journey was of 6hours including 1 hour in Sankri for lunch. After Sankri only jeep is available and the road condition is extremely poor. Taluka has a few hotels, a Forest Department's Forest Rest House and a GMVN tourist lodge. GMVN tourist lodge is not well maintained and FRH requires written permission from Dehradoon's forest office. Starting early in the morning from Dehradoon, Sankri can be reached directly skipping the night stay at Purola. Bus for Sankri leaves Dehradoon in 5:30AM and 6:30AM respectively. There are also some other alternatives like Mori, Naogao, Netwar etc. for night staying. This is the first day of the trek. Trekkers target to reach Seema or Osla village for night halt, crossing the village Ghangad. Seema has a GMVN bunglow. But it is suggested to bring your own accommodation. Then anywhere you can halt. We chose the second option and stayed a few kms. before Osla. This day's destination is Har-ki-Doon valley. It is possible to reach the valley in 6/7hrs. In Har-ki-Doon there is also a GMVN bunglow and a forest rest house, but tent is better option. There are two small valleys, first one 1.5-2kms before of Har-ki-Doon and the second one is just beside Har-ki-Doon, are used by trekking groups as camping ground. Enjoy the Paradise from early morning. Nothing else to do except creating some memories to cherish forever. If time permits, have an excursion to Monindataal (3km) or Jamdhar Glacier (4km). Start the descending trek around 10o' clock and try to reach Seema/Osla. Descend down to Taluka along with Supin. Having lunch there, book a jeep to Sankri. If you have time, catch a bus/car to Purola. Sometimes jeep from Taluka runs upto Mori and then from Mori Purola is accessible by shuttles. Sankri, Mori and Purola, all towns have good enough accommodations for staying. Buses and private cars are available for Dehradoon. Starting early in the morning it is possible to reach Haridwar or Rishikesh in the same day. Please have a look at our Har-ki-Doon travelogue for additional informations and visit this link for photologue in flickr. Hopefully it will be helpful for you. => Here is our travelogue. ABC - অন্নপূর্ণেশ্বরীর মন্দিরে | Flickr - Photo Sharing! Har-ki-Doon - ভগবানের আপন দেশে | Flickr - Photo Sharing! Hooghly - হুগলী | Flickr - Photo Sharing! Maenam La - মৈনাম গিরিপথে | Flickr - Photo Sharing! Sandakphu - কাঞ্চনজঙ্ঘার কাছাকাছি | Flickr - Photo Sharing! Varanasi - বারাণসী | Flickr - Photo Sharing!